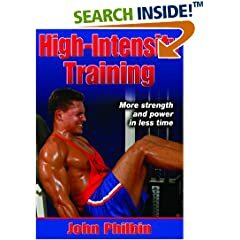 John Philbin is the founder and president of the National Strength Professionals Association, and at one point was an assistant strength coach with the Washington Redskins, under Dan Riley. Coach Philbin is a guy who is very well respected in the strength game, a guy who has paid his dues with athletes from all walks of life. The High Intensity Training publication is considered to be the ultimate source for understanding and implementing this training protocol. This method assists athletes when it comes to getting over training plateaus and helps boost power output. Evolving out of the one-set-to-failure approach, Coach Philbin has condensed his 25 years of experience into an 11 chapter 224-page publication. In his book he teaches how to perform the perfect rep, minimizing momentum and maximizing muscle tension. By doing this you will make the muscle work harder than longer and provide deeper stimulus to muscle fibers throughout the entire range of motion, developing optimal strength in the targeted muscles. He also shows you how to use the triple progressive overload principle and other advanced training techniques. Pre-and post- exhaustion, forced negatives, multiple sets, isometric pauses manuals, and breakdowns that will push your muscles beyond failure to help you reach your next level of performance.